In this android zoom out tutorial, you will learn to implement Zoom out animation in android application using XML and little bit java code. Android view animation is the basic animation in android and also easy to implement in application. Android animation can be used in many ways. Following example shows you to use animation in android app. View animation can be defined either in XML or java code. In this android zoom out example project, I have used an ImageView and a Button. When you click Start ZoomOut Animation button, the image will start to zoom out. 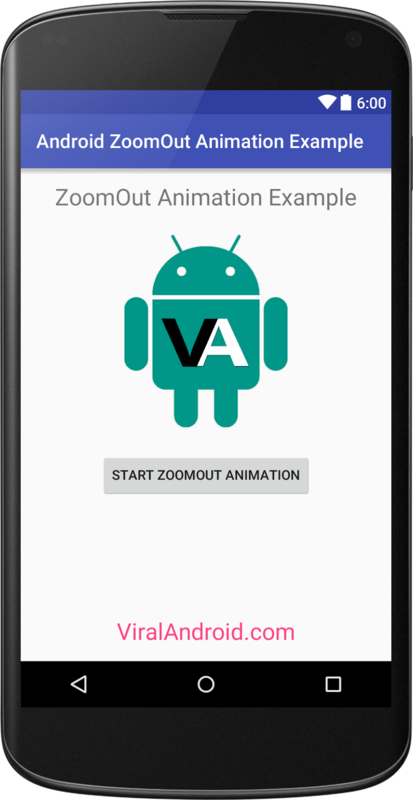 To implement zoom out animation in android application from XML, first we need to create xml animation file in res/anim/ directory and following is the xml content of anim/zoom_out_animation.xml file. That’s all. Now, run your android zoom out application and click the Start ZoomOut Animation button then the image will zoom out.